I am looking for a vehicle to occasionaly tow a 1800LB popup camping trailer. 95% of the time the vehicle will be used for short distance suburban driving and so I want to use the 2.5i not the 3.6 Subaru Outback. Does anyone have experience towing a simlar load? Is the CVT a good soluion for towing? I towed a similar camper for several years with my 2010 2.5. Never a problem towing. Certainly added to the stopping distance....hopefully yours has electric brakes. IMHO, I wouldn't. The 2015 2.5 has a weaker version of the CVT than the 3.6. I have had no trouble, but I'm not willing to risk it. I own a 2011 3.6R Outback with the 5eat automatic. I use it for towing my utility trailer (approx 600-800lbs) loaded with my sled (another 600lbs or so) or hauling crap to the landfill etc . It hauls the load with no trouble at all. It has a 3500lb tow rating, so a pop-up trailer should not be a problem. As for the cvt, I don't really know what they are like for towing but my gut feeling says avoid it. Regarding the 4cyl vs 6cyl; I would say go with the 6. I know the 4 gets much better fuel economy on paper. However the real world penalty for the 6 is a lot smaller than you might think. I average 12L/100km (20mpg) in mixed driving and 9L/100km (26mpg) on two lane secondary roads. 8L/100km (29mpg) if I nurse it. I test drove both before purchasing and found the 4cyl to be hopelessly underpowered and it was working hard the whole time. Whereas the 6cyl makes passing and merging a breeze and is just a very relaxed non-stressed engine overall. I have both a 2.5 and 3.6 Outback and I see both models this year are rated at 2700lbs towing. The 3.6 has a upgrated CVT over the 2.5 and if I was to choose one over the other for towing it would be the 6. As a general rule more cylinders are always better regarding towing because of the duration between detonation. Neither model get upgrades for towing ie oil/transmission coolers so I would be reluctant to do much towing with either. I like both cars but feel the 3.6 is more main stream and yes the difference in gas mileage is not that great although the 2.5 has best the 3.6 on trips when driven with gas mileage in mind. Interesting. I wonder if the change from the 5eat (conventional auto) to the CVT accounts for the change in towing capacity or if they changed it when they updated the whole car? An 1800lb camper ( or the 2700/3500lb rated weight) isn't really that heavy. Unless the OP is living in a hot climate or plans to tow more than a few times a year, I personally wouldn't be too concerned about the lack of an oil or transmission cooler. Acutally the 2016 brochure had the 3.6r rated for 3000 lbs and the 2.5 at 2700 both with Cvt transmissions. Maybe there were some warranty issues or claims against Subaru for them to change the ratings? I agree that with sensible use either car can be used to tow within thier rated specs. That said most people do not really look at how much they are towing and weight alone is not the only factor to consider. The mass of the object being pulled and speed in steady state use can be equally taxing while weight is normally an issue with stopping and starting. Synethic oil provides more protection than before but you still can not overlook oil coolers for operation in the south or western states during the majority of the year. It doesn't seem like a CVT necessarily reduces towing capacity. Nissan rates the 2017 Pathfinder for 6,000 lbs, the most in its class. 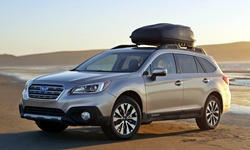 The engine will be the weak point as the latest Outback is only rated to tow 1,350 lbs without trailer brakes. Seems like every generation Subaru is lower tow ratings in an effort to put light duty power twins to cook EPA numbers. It is one of reasons their windshield cracking due to the thinness.